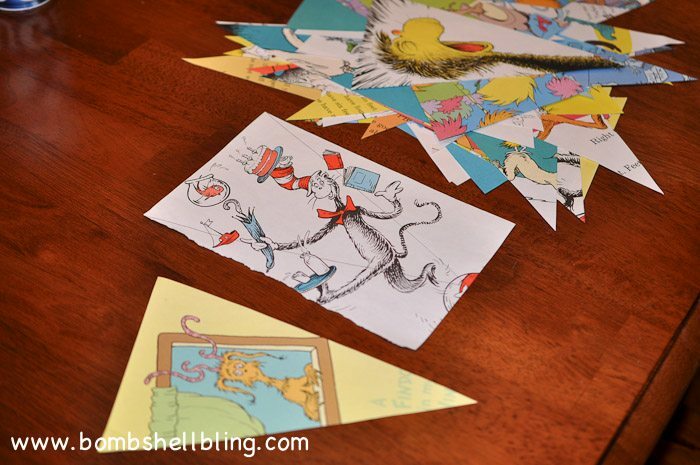 Hello, Dr. Seuss lovers! 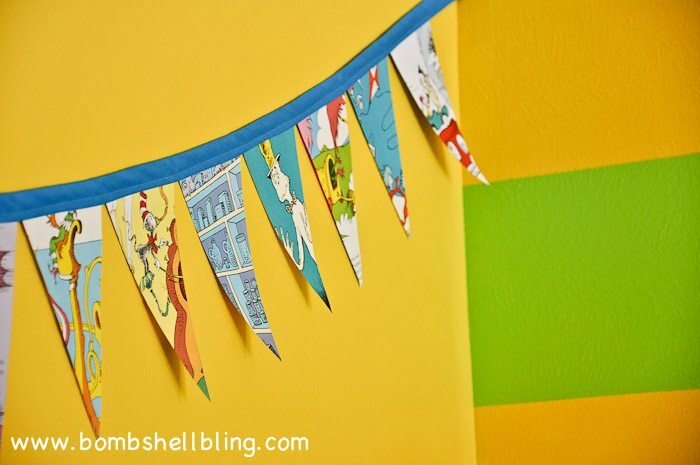 Today we are going to talk about how I made these super fun book page pennant banners for my son’s Dr. Seuss room. Have you seen his full room reveal yet? Check it out HERE. You won’t be sorry! 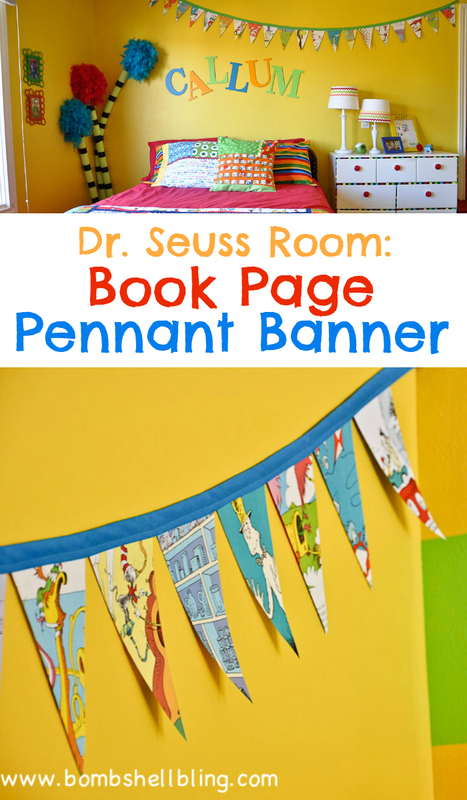 If you love bright, fun, or Dr. Seuss then I know you will love it! 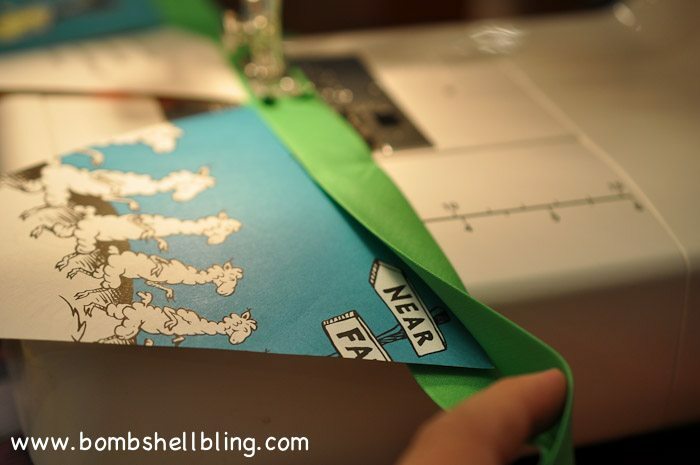 Now on to the simple tutorial that will teach you to make your own book page pennant banner. 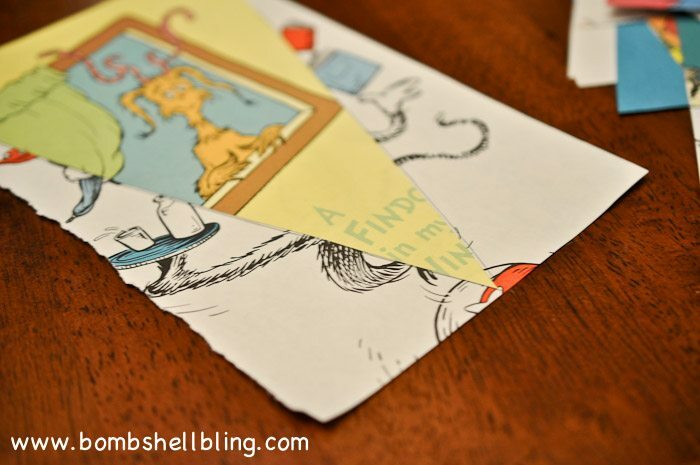 You can obviously adapt this to use pretty scrapbook papers, vintage Golden Books, Disney books, or anything else! The sky is the limit! 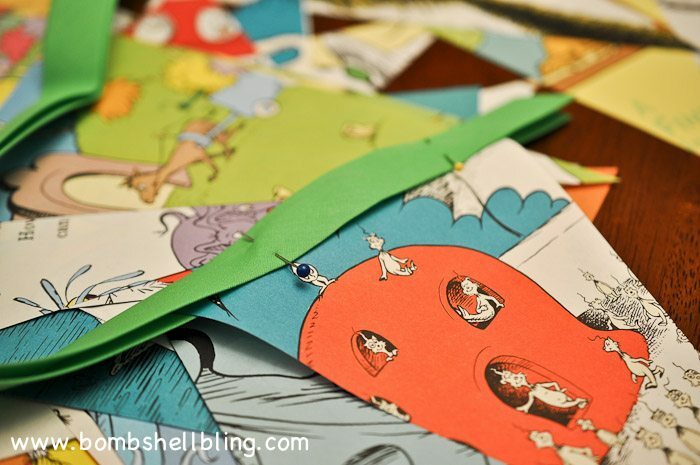 Carefully tear a page out of one of the books. 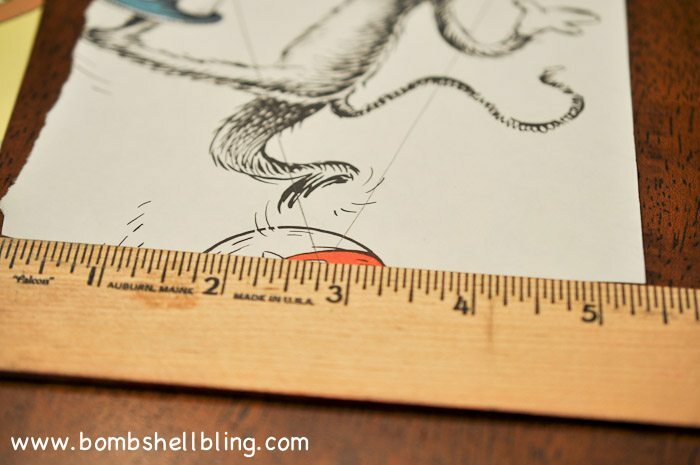 Measure to the center of the page along the bottom and mark it. Now being in the corners and use the ruler to create straight lines diagonally down to that point. Cut. 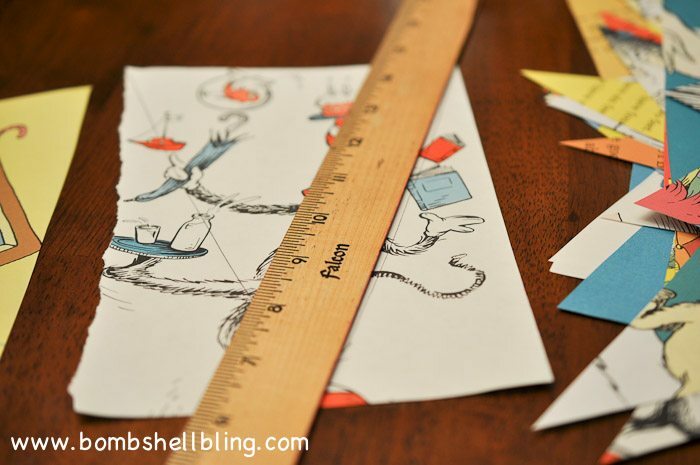 Now that you have one pennant you can use it as a stencil to cut more that are the same size. 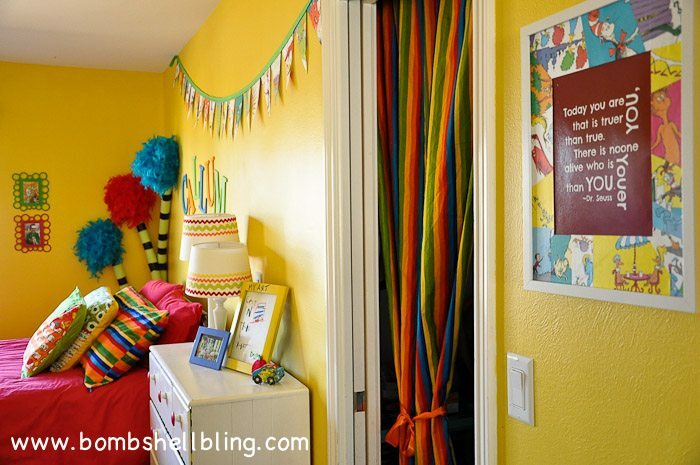 I used a variety of books so that there would be all different colors and characters throughout the room. Cut, cut, cut until you have enough. You can always cut more later. Now shove the pennant banner pages into the fold of the bias tape. 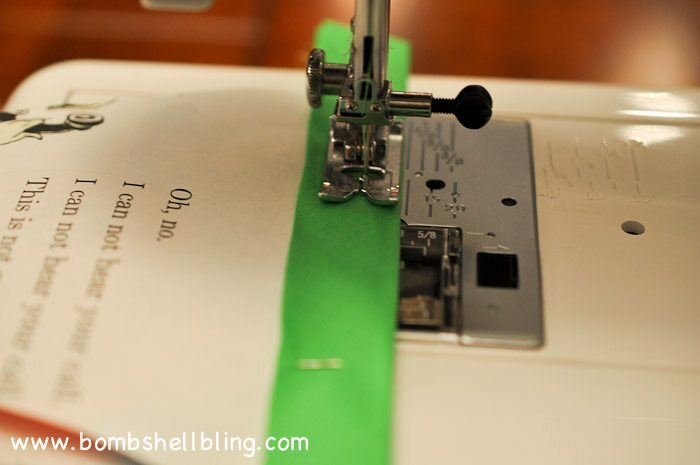 Pin if you are an unsteady seamstress and slowly sew over the bias tape in one long, continuous straight line. I didn’t want to bother with pinning, so I just stuck them in as I went and sewed slowly. Repeat this process until your pennant banner is as long as you would like it. I love the way mine turned out! 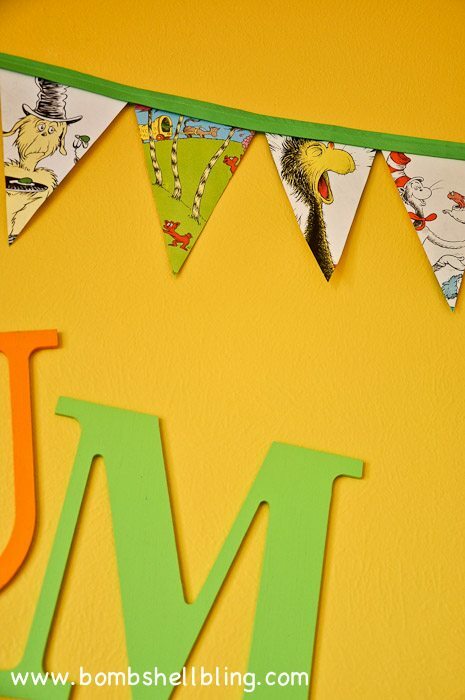 They really add the perfect flair to my boy’s Dr. Seuss room. I also think that these would be perfect for elementary classrooms, playrooms, book fairs, or read-a-thons! My sister used pretty scrapbooking paper to make one for my baby shower as well a few years ago. So versatile! Great minds! 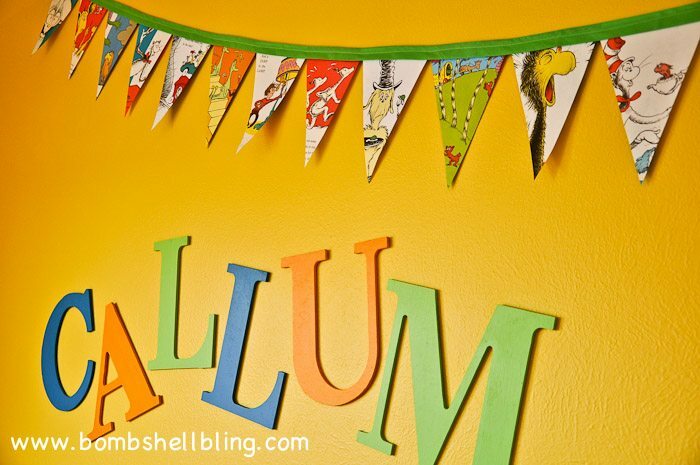 I made one very similar to this for a friend’s nursery back in January. 🙂 Yours is super cute!